On May 1, 2018, the City of Vancouver received an application from BC Housing in partnership with Vancouver Coastal Health, in accordance with a Memorandum of Understanding established with the City of Vancouver, to rezone the subject site from I-2 (Industrial) and RM-4N (Multiple Dwelling) Districts to CD-1 (Comprehensive Development) District. This application is being considered under the Grandview-Woodland Community Plan. A community open house was held on Monday, June 11, 2018 from 5:00-7:30 pm in Room 1236 of Building B at Vancouver Community College, located at 1155 East Broadway. The applicant team and City staff were available to answer questions about the rezoning application. One additional level of underground parking. This application has been approved by Council at Public Hearing on February 21, 2019.
bicycle parking reduced to 89 spaces. 39 car and 100 bicycle parking spaces. 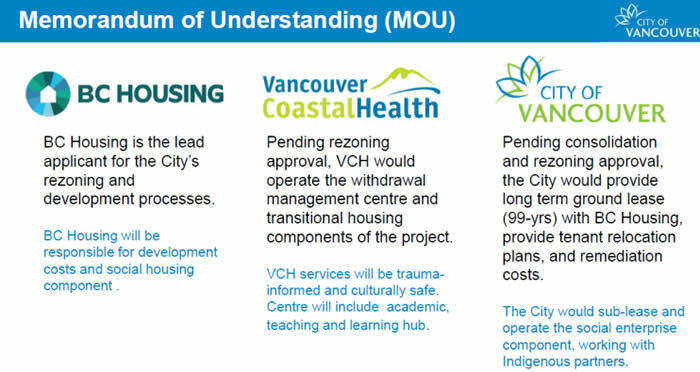 The City of Vancouver has entered into a Memorandum of Understanding (MOU) with BC Housing and Vancouver Coastal Health (VCH) with the intention of establishing a cooperative partnership between all three parties to construct a mixed-use development that would provide the following facilities: social housing, a withdrawal management centre, and employment through the social enterprise centre on site for residents of our city. This project aims to address key gaps identified in the City’s Housing Vancouver Strategy, Mayor’s Task Force on Mental Health and Addictions, Community Economic Development Strategy, as well as Vancouver Coastal Health’s Downtown Eastside Second Generation Strategy and Mental Health and Addictions Plan. The MOU was approved by Council in May, 2018 and can be accessed online here. 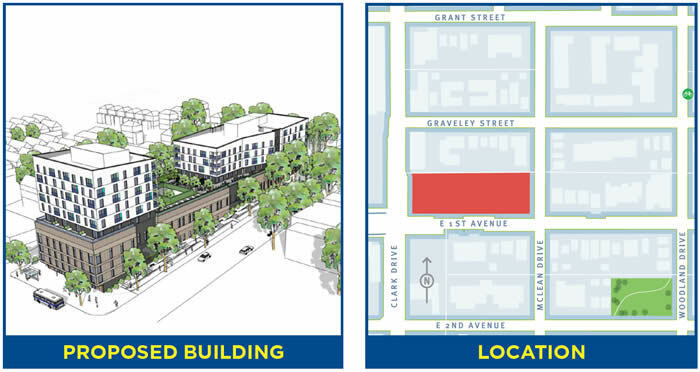 This project is subject to the City of Vancouver’s Rezoning, Development Permit and Building Permit processes which includes a Public Hearing at the time of rezoning. BC Housing is the lead applicant for the rezoning and permit processes and has engaged HDR|CEI Architecture as the project architect.